The Venus 2nd Gen UPS, which is an upgrade to the Venus UPS, can do everything its predecessor could, but has some added features as well. Much like Smart Power System’s other UPS products, the Venus 2nd Gen has an user-friendly replaceable battery; the battery is hot swappable, meaning it can be replaced without shutting down the system. In addition to its automatic monthly battery test capability, this UPS utilizes upgraded UPSwing software that lets the user know how much backup time the battery can provide during its life time. In the event of a power outage, the user will know exactly how much time is left to shut down the system in an orderly fashion. The Venus 2nd Gen filters noise that interferes with the network to less than 0.5 volts. It also helps eliminate the need for multiple power protection units by providing 6 receptacles for all POS system equipment, including the terminal, receipt printer, and other POS peripherals. 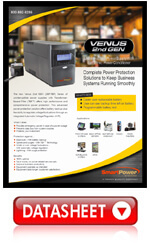 The latest evolution in the popular series of UPS from Smart Power Systems, the Venus 2nd Gen UPS offers the battery backup capability of a UPS plus the ability to regulate voltage fluctuations (responsible for 10% of all power problems) through an integrated Automatic Voltage Regulator (AVR). It also includes Smart Power Systems’ electronic power conditioner (TBF™), which protects against surges and spikes of less than 200 volts (responsible for 87% of all power problems) as well as spikes of over 200 volts (responsible for 2% of all power problems). Together, these features cover almost 100% of all power problems. 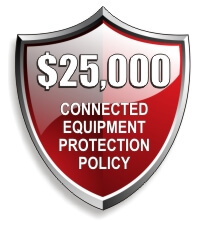 Smart Power Systems’ UPS, bundled with our connected equipment protection policy, assures the protection of your system. Available in higher VA outputs. Ask your Smart Power Systems representative for additional details.